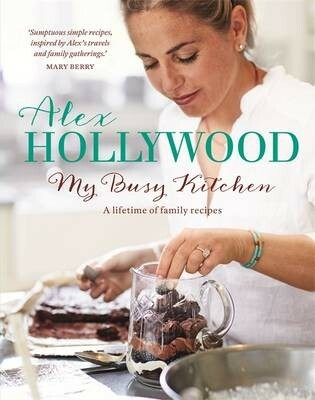 As Bake Off judge Paul Hollywood freely admits, it's his wife Alex who is in charge of cooking in the Hollywood household. She's the one who plans, shops and cooks so they can enjoy delicious home-made food with family and friends. An accomplished self-taught cook who comes from a family of food-lovers, Alex is passionate about food but firmly believes that cooking and eating are about one thing: enjoyment. Her recipes fall into one of two categories -- quick and simple for when you don't have much time during the week, or slow and simple for a lazy weekend at home. But simple doesn't mean ordinary. With a few clever twists and drawing on influences from her travels and her family (a glamorous French grandma, a father brought up in Spain and a Norwegian great grandmother) Alex's recipes are easy, inexpensive and just a little bit different. For anyone who wants inspiration for quick mid-week meals, impromptu kitchen suppers with friends or relaxed weekend socials, My Busy Kitchen is the book for you.